Santa Clara, CA – April 14, 2015 – IT Brand Pulse, a trusted source for research, data and analysis about data center infrastructure, will be honoring 2015 Innovation Leaders—as voted by IT pros in twelve product categories—at Ethernet Technology Summit on Wednesday, April 15, at the Santa Clara Convention Center. In addition, annual survey respondents chose Cumulus Networks and VMware for special innovation achievement awards. 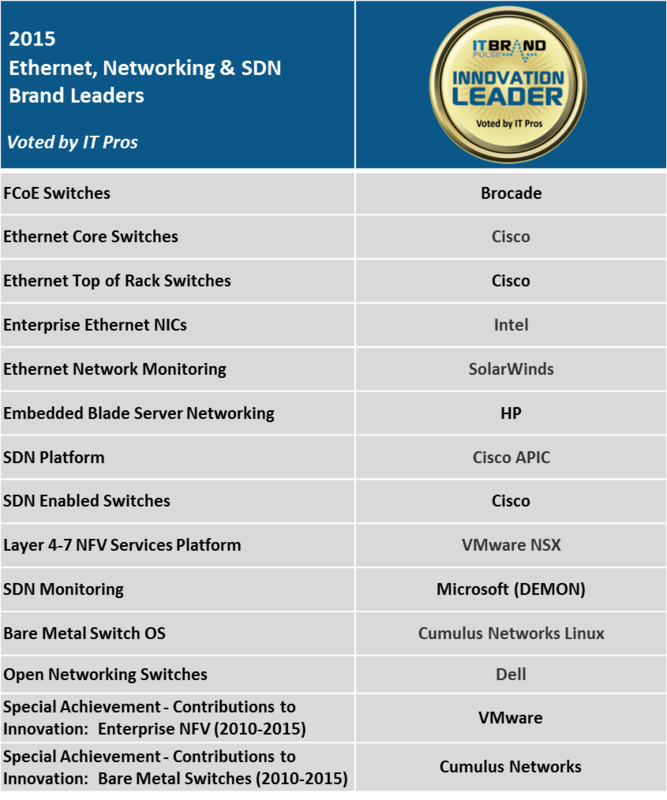 Cumulus Networks was the IT professionals’ choice for its Contributions to Innovation in Enterprise Bare Metal Switches over the past five years (2010-2015). Cumulus Networks will also be accepting the 2015 Innovation Leader award for Bare Metal Switch OS at ETS. VMware took home the Contributions to Innovation in Enterprise NFV (2010-2015) title to earn the other special achievement award of the survey. VMware also captured the winner’s share of the 2015 Innovation voting by being named the leader for Layer 4-7 NFV Services Platform. IT Brand Pulse awards are the symbols for brand leadership. Winners are voted by IT pros in surveys that are independent, nonsponsored research. The surveys are designed to measure the pulse of brand leadership in specific product categories. Within each product category, respondents choose the overall market leader, as well as the leader in price, performance, reliability, service and support, and innovation. Respondents are provided with a category description at the start of each product section, a randomized choice of vendor answers, and the ability to write-in a vendor, if not listed. Respondents to our surveys included (select list): AT&T – Server Administrator/Architect; Blue Cross Blue Shield Association (BCBSA) – Storage Administrator/Architect; Boeing – Data Center Manager; Booz Allen Hamilton – Network Security Architect; CalPERS, State of CA – Network Administrator/Architect; Caterpillar – Server Administrator/Architect; Citigroup – Network Administrator/Architect; City of Los Angeles – IT Manager/Director; Delta Airlines – Server Administrator/Architect; Duke University – IT Manager/Director; EarthLink – Server Administrator/Architect; Environmental Protection Agency – Network Administrator/Architect; ExxonMobil – Network Administrator/Architect; Fermilab – Network Administrator/Architect; Ford Motor Company – Network Administrator/Architect; GE – IT Manager/Director; General Dynamics – Network Administrator/Architect; General Motors – Server Administrator/Architect; Johns Hopkins University Applied Physics Lab – IT Manager/Director; JP Morgan – IT Manager/Director; Lockheed Martin – IT Manager/Director; Los Alamos National Lab (LANL) – Network Administrator/Architect; Lowe’s – Storage Administrator/Architect; Mattel Inc.- IT Manager/Director; Morgan Stanley – Network Administrator/Architect; NASA – IT Manager/Director; National Geospatial Intelligence Agency (NGA) – Network Administrator/Architect; National Oceanic and Atmospheric Administration (NOAA) – IT Manager/Director; Northrop Grumman – Network Administrator/Architect; Oppenheimer – Executive/Management; PepsiCo – Storage Administrator/Architect; Porsche Cars North America – Network Administrator/Architect; REI – Server Administrator/Architect; Sandia National Labs – Network Administrator/Architect; Shell – Storage Administrator/Architect; Social Security Administration (SSA) – Server Administrator/Architect; Stanford University – Network Administrator/Architect; Staples – Network Administrator/Architect; Target – IT Manager/Director; The University of Chicago – Server Administrator/Architect; Thomson Reuters -Server Administrator/Architect; T-Mobile – Data Center Manager; Transamerica – Storage Administrator/Architect; UBS – Executive/Management; UCLA – IT Manager/Director; United Airlines – Network Administrator/Architect; Universal Parks and Resort – IT Manager/Director; University Of Michigan- Data Center Manager; University of Michigan Medical School – IT Manager/Director; University of Notre Dame – Storage Administrator/Architect; USC – Network Administrator/Architect; Verizon – Network Administrator/Architect; Yale University – IT Manager/Director…among many others.